Imagine, if you will, our world as it is today. Now, imagine that all of the men on Earth die off from some unknown disease. Imagine the destruction that would occur when men die in the middle of the day, in the middle of piloting a plane or mid-surgery or mid-anything. The surviving women don’t know if this is the Rapture, a plague, a terrorist attack, or what the root cause could be. First there is anarchy, and then the women begin to patch things back together. They learn that it isn’t just all the men, but all the males of each species. But, one man survived. Yorick Brown. So did his monkey, Ampersand. You’d think that being the only man alive on a planet full of women would be heaven. You would be wrong. Between women trying to kill him (really), governments trying to use him, and everybody having an agenda, being the last man isn’t exactly a walk in the park for Yorick. Here’s the thing, though – even though Yorick is the titular character of this sixty issue series (collected in ten graphic novel volumes), Yorick is actually quite a bit less interesting than the various characters surrounding him. Yorick is the baseline, a male with a basic human decency who wants nothing more than to find his girlfriend Beth who was in Australia when the plague hit. Yorick is not a great man, but he is a decent man who is being pulled and push around by various forces who want use him for what he is and what he represents. There are two primary characters who accompany Yorick throughout the series: Agent 355 and Dr. Alison Mann. Agent 355 is a member of the Culper Ring, which is sort of like a Secret Society within the Secret Service (to simplify matters greatly. They have numbers, not names. Dr. Mann is a geneticist who was working on human cloning. The various storylines revolve around three basic actions: protecting Yorick (355’s job), getting Yorick to a working lab to figure out why he lived and how to clone him and rebuild the male population, and finding Beth. Again, this is another gross simplification of the issues involved in this series and the outstanding characterization going on here. 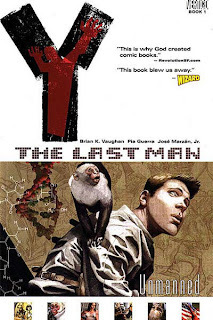 Y: The Last Man is written by Brian K. Vaughan and drawn by Pia Guerra. Together they do an excellent job in telling a compelling story which touches on various issue of morality, hope, gender equality, and the landscape of a postapocalyptic world (which this truly is, given that half of the world’s population is dead). Vaughan handles this in a delicate but realistic manner and simply put, Y: The Last Man is an outstanding achievement of the medium. Even better, Vaughan knows how to close out the story. He ends the series with a bittersweet epilogue (because how could it be other?) that perfectly captures the tone of everything that came before and stays true to the characters. This is probably a defining work of the medium, I think. I agree, the ending is terrific and one that leaves little room for complaint.